Are you sick of our mudroom yet? I didn’t think so. 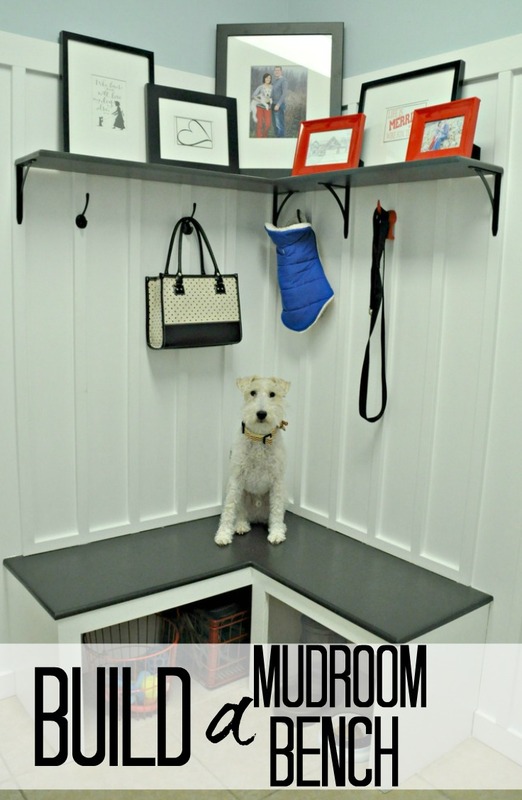 Today we’ll share with you how we built our mudroom bench. I find this stuff boring but it will be a good resource for us in the future and it will hopefully help some of you out as well. At least there are some pretty pictures. Nate is going to make us look like fancy bloggers with his SketchUp designs. I’m going to let him explain this one because all I did was paint the thing…. We first purchased two 4x8 sheets of 3/4" MDF particle board. We only used one sheet plus a little bit of the second. We had a fair amount left over to build a shelf and then some. - 4 - 15 1/2"x18"
- 3 - 18"x 2 1/2"
- 39 1/2"x 2 1/2"
- 14 3/4"x 2 1/2"
- 42 1/2"x 16 3/4"
- 24 1/16"x 16 3/4"
We started by connecting the two sides to the back board. We used some wood glue between the two pieces and then used 2" finish nails in a nail gun. ). The jig was needed because there was nothing to nail into on the left side. Moving on to the right side of the bench. We built the right side the same way as we did the left side except the upper cross support needed pocket holes on both sides to attach to the side supports as there was nothing to nail it into. Then we took the 14 3/4" x 2 1/2" piece and placed it in the top left side and nailed it in make sure the top had something to attach to. Next, we put the two sides together, making sure they were square (or whatever angle the corner is you are placing the bench into), then we nailed them together through the upper supports in both directions. Then we placed each top piece onto the bottoms and nailed down into the bottoms (after gluing, of course). We used a hand sander to smooth out the pieces that were placed together to ensure that were flush. We filled in all the nail holes and any gaps with wood filler. We then sanded and repeated until the bench was smooth. We then painted and placed the bench in the mudroom. Now I can finally go watch Big Brother. And Michelle wears 90’s soccer sandals too. Don’t let her fool you. Everyone thank Nate for writing that tutorial so willingly!! Anyone have any questions? Now for fun stuff, who’s watching HGTV Design Star. I’m just getting caught up. Who’s your favorite? Who’s watching Big Brother? Who thinks this season is awful because they brought Rachel back?